CHEAP energy matters most to poor people, and the coal industry’s hopes have rested on emerging economies burning the black stuff to fuel their modernisation. But growing energy efficiency, rising pollution worries and stiffer competition from other fuels mean that in most countries the tide is turning against coal. Prices have been sliding (see chart), political opposition growing and demand dropping. The Dow Jones Total Coal Market index has fallen by 76% in the past five years. High-cost deep mines in the rich world are worst-hit: in America 24 coal companies have gone bust in the past three years, and one-sixth of the remaining capacity loses money. But even Australia, whose low-cost opencast mines play a role akin to Saudi Arabia’s in the oil market, is jittery. Stoking the gloom is China, once the strongest market. It is still the world’s biggest coal consumer, and has accounted for four-fifths of global demand growth since 2000. But Chinese consumption dipped by 1.6% in 2014, despite economic growth of 7.3%. 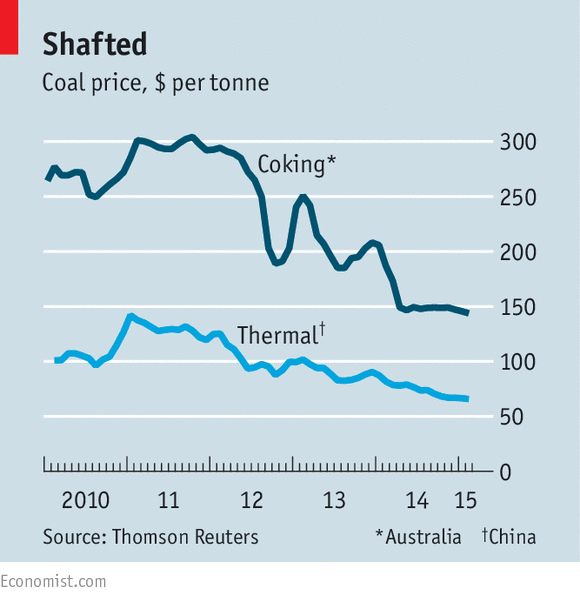 The country’s voracious appetite for steel is peaking, damping demand for coking coal. Worries about pollution mean that demand for thermal coal, as used in power stations, is slackening too. Water conservation is another concern for policymakers—on current trends coal could account for a quarter of China’s water use by 2020 and coal reserves are mainly in the most parched regions. Its coal-fired plants are running at only 54% of capacity, a 35-year low. In Beijing two big coal-fired plants closed this week; the capital’s last one will shut down next year. Coalswarm, an environmental think-tank, says in a new report that two-thirds of coal-fired power plants proposed worldwide since 2010 have been stalled or cancelled. The growth rate in coal-fired generating capacity is slowing, down from 6.9% in 2010 to 2.7% in 2013. In 2014 the world added more generation from windpower than coal. Overall, Europe and America have already cut coal-fired generation capacity by over a fifth in a decade. The output of American coal mines dropped to 1993 levels in 2013 (though consumption rose slightly, compared with 2012, as stocks were run down). Political pressure is growing against the most carbon-intensive fossil fuel. Coal provides 40% of the world’s electricity. But of 1,617GW of global capacity, 75% is of the dirtiest kind, which burns coal at low temperatures and emits 75% more carbon dioxide than the most advanced (and costly) “ultra-supercritical” plants, which burn powdered coal at high temperatures. The chimneys of all but the most modern coal plants also emit plenty of other nasties. Mercury emissions stunt young brains. Sulphur and nitrous oxides scald lungs. Overall, coal kills around 800,000 people a year, most of them poor. In China it is responsible for up to a sixth of the particulates most dangerous for human health. Germany is introducing new CO2 curbs to force the closure of its dirtiest coal plants. In America the coal and electric-utility industries are fighting the Environmental Protection Agency’s attempts to curb emissions of CO2, mercury and other toxins contained in coal. On March 25th the Supreme Court heard arguments by some state governments, backed by the miners and utilities, that the agency has failed duly to consider the cost of its measures against mercury (see page 48). Campaigners reckon 80% of the world’s coal reserves must stay in the ground if the planet is to stand a chance of keeping global warming under 2ºC by 2050. A divestment movement akin to the apartheid-era campaign to boycott South Africa is under way in many universities. Stanford may dump its coal investments and Oxford University is under pressure to do likewise. The World Bank no longer invests in coal-fired plants. Last year Norway’s sovereign-wealth fund dumped its holdings in more than 50 coal companies worldwide. South Korea recently introduced a carbon cap-and-trade scheme which punishes coal. The horizon is not wholly bleak for coalmen. Clean-coal technology can abate the worst pollution, at a cost. Schemes for capturing power stations’ CO2 emissions may one day prove economic, countering coal’s reputation as a planet-cooker. Even though some other developing nations’ coal imports will grow in future, coal companies are having to face up to a crisis now. Some are cutting costs and getting ready for a wave of consolidation. Others are litigating and lobbying against change. In Poland, Europe’s largest producer, pampered and powerful miners produce costly deep-mined coal that nobody wants to buy. It costs the state-owned miner, Kompania Weglowa, $80 to mine a tonne of coal against a world price of $61 for similar grades. A stockpile of 16m tonnes continues to grow, as Poles import much cheaper coal from Russia. Miners have nonetheless reacted furiously to plans to close four of the countries’ least efficient mines and to create a new company with nine more viable ones. The authorities, in the run-up to elections this year, quickly retreated. The biggest danger for the coal miners is that capital ceases to flow their way. Investors can cope with a cyclical business, but the fear now is of a structural shift, in which China follows the rich world in beginning to phase out coal, India increasingly produces its own, and a plentiful supply of cheap gas keeps prices low everywhere. If so, new coal-mining investments would risk becoming stranded assets, and older deep mines would be even more uneconomic than now. Carbon Tracker, a non-profit group, reckons that more than $100 billion-worth of planned capital spending risks being stranded by 2035. A prospect as black as a miner’s lungs.